When I met Dr Teddy Fagerstrom at Bangkok Hospital Phuket, the crisp white medical scrubs he was wearing didn’t quite match up with his scruffy grey beard, earrings and tattoos. Dr Teddy Fagerstrom with a high-tech metal prosthetic leg. 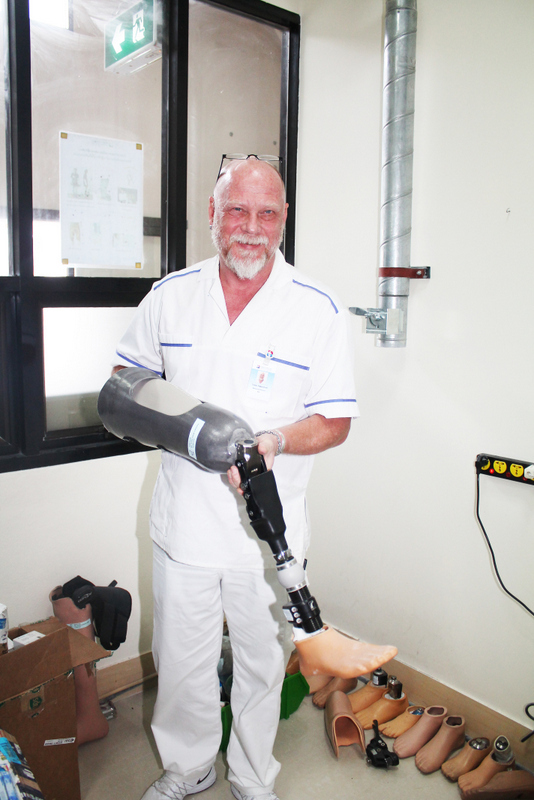 Bengt Söderburg helps adjust the fitment of a patient’s prosthetic leg. The team help adjust the fitment of a patient’s prosthetic leg. This incongruence made more sense when I found out that in his spare time he rides a Harley and plays bass in a rock ’n’ roll band. When he is at work though, Dr Teddy, along with his colleague Bengt Söderburg, runs one of the leading prosthetic limb clinics in Asia, helping hundreds of people regain their ability to walk, work, play sport and live their lives to the fullest. When Teddy moved to Thailand about 13 years ago, he had plans to stop practising in his field of orthopaedic surgery and open a wellness centre for people who were “lost in our Western medical system,” as he puts it. 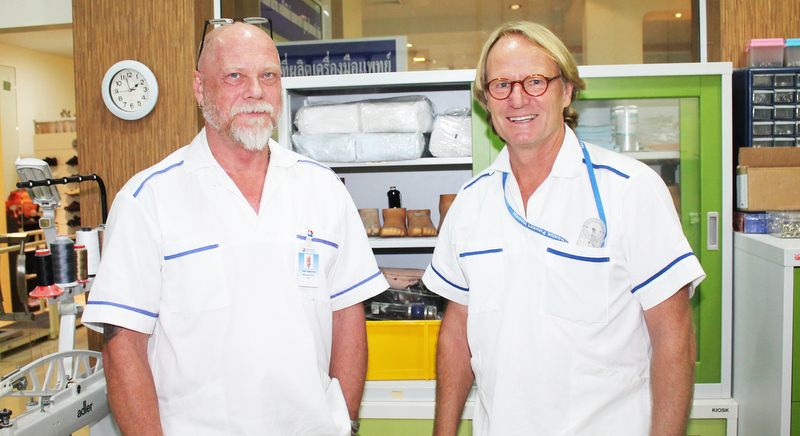 But the 2004 tsunami soon changed those plans and it was a chance meeting years later “probably in a bar” with Bengt, himself a certified practising orthotist, that ultimately led them to combine their energy and expertise and set up the Scandinavian Orthopaedic Laboratory Clinic here in Phuket. As Teddy and Bengt show me around their small clinic inside the hospital, I learn that despite its small size, it is leading the field in Asia, with patients from around the region coming to receive treatment and be fitted with cutting-edge prosthetic limbs. “We basically have three parts to our service, one is the prosthetics arms and legs, the second is braces for various conditions like knee braces, scoliosis braces, fracture braces, ankle braces or for Achilles tendons, and also orthotics for children with birth defects,” says Teddy. “The third thing we do is motion analysis – running analysis, walking analysis, and we check people’s feet and knees, because depending on how they run and they’re configured we may need to compensate to support their ankles and foot arches. We do a lot of analysis for sports too, especially for endurance sports like marathon running, triathlon, hiking – these athletes can really benefit from a proper insert in their shoe. Teddy and Bengt’s chance meeting must be some sort of cosmic karma, as their different areas of expertise overlap perfectly to make them a two-man powerhouse in the world of prosthetics. Within their small clinic they can custom make everything from a simple corrective insole to extremely advanced prosthetics for people who are severely disabled. “We’re pretty unique actually,” says Teddy, “It’s a lot of teamwork, because Bengt’s background is as an orthopaedic engineer and my background is as an orthopaedic and spinal surgeon. “As an orthopaedic surgeon I know the anatomy and function, but not how to apply the bio-mechanics to prosthetics to get the alignments correct and enable people to walk correctly. "Whereas Bengt has worked in many countries around the world in bio-mechanics, so he is much more experienced with that than I am,” Teddy explains. Over the years they have helped many people, rich and poor, to regain their mobility and therefore their ability to lead normal lives. You may have heard of some of their more prominent patients such as local wakeboarder Mac Rosen, who lost his lower left leg after a severe injury, or Soi Dog co-founder Gill Dalley, who lost both of her legs below the knee to a freak infection after rescuing a dog from a flooded field (they have even made prosthetic legs for some of Gill’s rescued dogs). Both Teddy and Bengt agree that helping people to walk and work again is one of the most satisfying aspects of their work. But their passion goes beyond Phuket – Bengt is closely involved in an orthotist training clinic in conjunction with Mahidol University and Siriraj Hospital, both in Bangkok. The clinic, the Sirindhorn School of Prosthetics and Orthotics (SSPO) at Siriraj Hospital, is the only one of its kind in Southeast Asia and students from around the region can train there and bring essential skills back to their home countries. Bengt also assists the World Health Organisation with their efforts to lobby governments to include orthotics and prosthetics as part of universal essential medical care across the world. “We have been working for a couple of years to set up a clinic like this one in conjunction with the school and we are just about to finish that – it’s a collaboration with Mahidol and our private company – the first ever collaboration like that in the world. The clinic is almost finished and it’s 10 times bigger then this one (in Phuket),” says Bengt. “So we are trying to raise the standard in Thailand and the clinic in Bangkok, along with the university, will set the benchmark and that will eventually raise the standard for everybody in Thailand,” he adds. “So we are keeping ourselves busy in many directions, but it’s loads of fun and extremely rewarding. It is just so much fun to go to work, and plus for me personally, I’m learning something new as I go along,” adds Teddy. The heart-warming story of one of their patients is just a small example of the life-changing work the clinic does. One day, after hearing about the clinic, a group of people brought in a Burmese fisherman who had lost his leg after a wire had wrapped around it and severed it. After three years without walking, or working, the man had almost given up hope. But within hours they had fitted him with a prosthesis and he was up and walking again. There was just one problem, he couldn’t even afford a pair of shoes. “He only had one flip-flop,” says Bengt. “Then our technician, who is Thai, went to his locker and got out his own shoes and gave them to him, and then he was off and out fishing again. The pair are certainly not resting on their laurels either. Bengt has recently established a company to import and distribute high-quality components for prosthetics into Thailand and the region – in an effort to break a monopoly that currently charges top dollar for these essential pieces of medical equipment. Teddy continues to collaborate with local government hospitals to treat some of their poorest patients with high quality prosthetics and provide essential preventative treatment to reduce the number of amputations needed.